Hvað gerum við þegar við þýðum tungumál? Við tökum hugsun, setningu, sjónarhorn og við finnum hugsuninni eða sjónarhorninu stað í nýju málkerfi, innan nýrrar málfræði. Samkvæmt hefðbundnum skilningi hefur þýðing engin alvarleg áhrif á inntak texta, Biblían á grísku er eins og Biblían á ensku sem er eins og Biblían á íslensku.Það er að minnsta kosti það sem við teljum okkum trú um. Þetta er svosem alveg nógu pirrandi, en það sem meira er, þá er ekkert upprunalegt tungumál til sem getur skorið úr um hinstu merkingu orða. Vonin um eitt grundvallartungumál er tjáð með sterkum hætti í sögunni af Babelsturninum, þar sem Guð refsar mannkyninu – sem átti eitt sameiginlegt tungumál – með því að fjölga tungumálunum í heiminum og gera fólk þannig háð þýðingum. En raunin er að sjálfsögðu sú að mannfólk hefur ætíð þurft að þýða því að merking er engan veginn stöðugt fyrirbæri! Hver einasta (mannleg) þýðing flöktir og umbreytist með ólíkum sjónarhornum, og bognar með tímanum, á milli þýðingar núna og þýðingar þá. Við rannsökum og upplifum heiminn í kringum okkur með ólíkum skynfærum og um leið og við reynum að skilja það sem við skynjum þá erum við þegar farin að þýða. Þýðingar eru nátengar merkingarframleiðslunni sjálfri. MA Hönnun: Könnunarleiðangrar og þýðingar er nafnið á meistaranámi í hönnun við braut hönnunar og arkitektúrs sem þeir Garðar Eyjólfsson og Thomas Pausz endurskipulögðu á árunum 2016 og 2017. Eins og nafnið gefur til kynna er meðal annars fengist við rannsóknir á þýðingum sem hluta af verkfærakistu hönnuða. Ef við skiljum þýðingar sem merkingarsköpun, þá fæst hönnun einmitt við að efnisgera merkingu, möguleika, hugsanir og sjónarhorn með ólíkum hætti á ólíkum tíma. Hönnuðir þýða í þeim tilgangi að gera merkingu aðgengilega nýjum viðtakendum og miðla einhverju sem birtist á sviði skynjunarinnar en krefst umbreytingar svo hægt sé að skilja eða tileinka sér það. Hönnuðir þýða þó yfirleitt ekki á milli tungumála, öllu heldur þýða þeir uppgötvanir, virkni, málefni, vonir og drauma, kerfi, þarfir, viðbrögð og veruleika. Við skulum huga að tveimur verkefnum eftir Garðar og Thomas, dæmi um tvær þýðingar, gáskafullar tilraunir sem efnisgera möguleika, hugsanir og sjónarhorn úr samtíma okkar. Í verkefninu Tegundir án rýma fæst Thomas Pausz við að þýða og enduruppgötva tegundatengsl í leit að nýjum siðferðilegum víddum. „Hönnuðir eru í fararbroddi þess að skapa og eiga við myndir, form og goðsagnir,“fullyrðir Thomas sem vonast eftir því að gera skynjun okkar á náttúruheiminum „villta á nýjan leik,“ eins og hann kemst að orði sjálfur. Með hönnun hluta og kvikmyndasýningum leitast Thomas við að grafa undan viðteknum leiðum okkar til að sjá heiminn utan við manninn. Hann telur þann heim meðal annars birtast á póstkortum, hefðbundnum landslagsmálverkum og í því hvernig náttúruútsýnisbyggingar eru reistar. Kjarni þessara tilrauna með birtingarmyndir er að velta upp viðteknum flokkum og stigveldi tegunda. Hér leikur Thomas sér í talsverðu návígi við hugmyndir bandaríska heimspekingsins Donnu Haraway sem hefur beint spjótum sínum að hugmyndum um að maðurinn sé frábrugðin öllum öðrum lífverum. Hugmyndir Haraway hafur borið á góma í MA náminu, meðal annars sú uppástunga hennar að þau hugtök sem við notum til að hugsa um hinn náttúrulega heim séu „alvarlega óhugsandi,“ það sé „ómögulegt að hugsa með þeim.“2 2 Donna Haraway, „Tentacular Thinking: Anthropocene, Capitalocene, Chthulucene,“ E-Flux Journal #75 (2016), e-flux.com/journal/75/67125/tentacular-thinking-anthropocene-capitalocene-chthulucene. Um er að ræða útdrátt Haraway úr samnefndum 2. kafla í / This text is an edited extract from a synonymous 2. chapter in: Donna Haraway, Staying With the Trouble: Making Kin in the Chthulucene, 30–57 (Durham: Duke University, 2016). Haraway setur slíka gagnrýni fram í samhengi þeirra loftlagsbreytinga sem orðið hafa á síðustu öldum og eru yfirleitt taldar vera af mannavöldum. Sumir vísindamenn hafa gengið svo langt að tala um nýtt jarðsögulegt tímabil sem kallað er mannöld. Hugtakið lýsir jarðfræðilegu tímabili þar sem „áhrif manna á hnattrænt umhverfi eru […] orðin svo mikil og virk að þau jafnast á við alvarlegustu áhrif náttúruaflanna á starfsemi kerfa Jarðarinnar.“8fn]Will Steffen, Jacques Grinevald, Paul Crutzen & John McNeill, „The Anthropocene: Conceptual and Historical Perspectives,“ Philosophical Transactions of the Royal Society A: Mathematical, Physical and Engineering Sciences, #369 (2011): 842, DOI: 10.1098/rsta.2010.0327. [/fn] Haraway mótmælir slíkri skilgreiningu með ofureinföldum rökum – hvernig geta hnattrænar hamfarir verið á ábyrgð heillrar tegundar? Slík hugmynd skellir skuldinni á fjölda einstaklinga sem hafa aldrei haft nokkuð vald til þess að raska einu né neinu. Tilgátuverkefni Garðars Eyjólfssonar, Barbara er tilraun til að skapa samtal um framtíðina án þess að verða vonleysinu að bráð. Garðar Eyjólfsson’s speculative design project Barbara is an attempt to open a dialogue about the future without losing hope. Annar hluti í röksemdafærslu hennar er sú sýn hennar að sagan um mannöldina sé einfaldlega ekki gagnleg, það er að segja að sú saga geti ómögulega náð til allra sem vettlingi geta valdið. Þegar ég frétti af „kolefnisbanninu“ sem tengdamóðir mín lagði á tengdaföður minn, því hún var orðin svo þreytt á því að heyra hann tala um ógnir loftslagsbreytinga út í eitt, þá varð mér hugsað til þessarar gagnrýni. Donna Haraway leggur áherslu á mikilvægi fjölröddunnar og fjölbreyttra frásagna sem stuðlað geti að samlífi á tímum sem eru „enn í húfi“, eins og hún kemst að orði.3 3 Ibid. Hún heldur mikilvægi þess á lofti að við segjum sögur sem leyfa okkur að takast á við þær erfiðu aðstæður sem við stöndum frammi fyrir, án þess að glata voninni og verða kaldhæðni eða forlagahyggju að bráð.4 4 Ibid. What do we do when we translate language? We take a thought, a sentence, a point of view and we manifest that thought or point of view within a new syntax, within a new grammar. A classical notion of translation insists that a translation does not affect the content in any dramatic way, the Bible in Greek is the same as the Bible in English and the same as the Bible in Icelandic. At least that’s what we tend to tell ourselves. This is frustrating enough, but what is more, there is no original language that might determine the ultimate meaning for us. That of course is the hope betrayed in the story of Babel, where God, as a punishment to the impunity of humans, multiplied the languages of the world, making people dependent upon translations. But the fact is, humans have always had to translate because meaning is not stable at all! Every (human) translation fluctuates and transforms with different points of view, it even undulates in time, between a translation now and a translation then. We explore and experience the world around us through our different senses and through making sense of what we sense, we are of course already beginning to translate. Translation is perhaps essential to meaning-making itself. 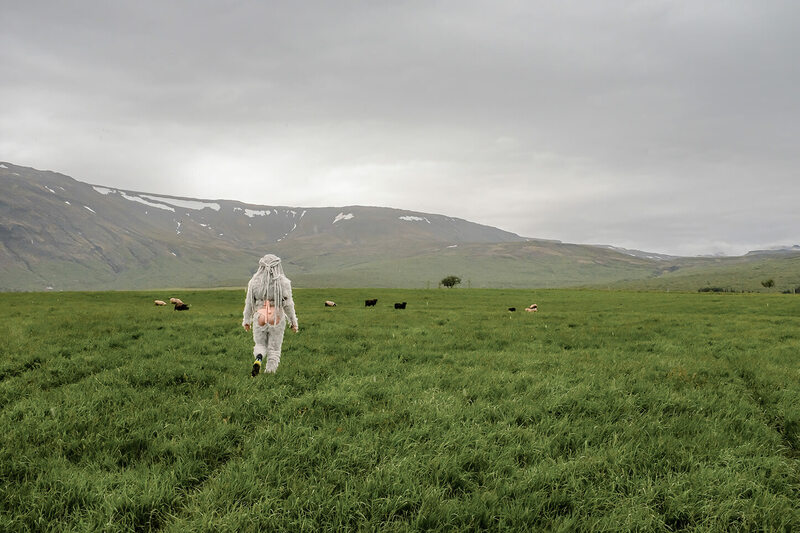 MA Design: Explorations and Translations is the full title of the MA programme at the Department of Design and Architecture, reorganised by Garðar Eyjólfsson and Thomas Pausz in 2016 and 2017. As the title suggests, the programme is amongst other things concerned with examining translations as a part of the designer’s toolkit. If we understand translations as meaning making, design is very much concerned with manifesting meanings, possibilities, thoughts and points of view in different ways at different times. Designers translate to make meaning accessible to new audiences and communicate something that exists within the field of sensation but must be transformed in order to become intelligible or comprehensible. Designers do not usually translate between languages, but rather, designers translate discoveries, functions, concerns, hopes and dreams, systems, needs, reactions and realities. Let us consider two projects by Garðar and Thomas, examples of two translations, joyful experiments that manifest contemporary concerns, possibilities, thoughts and points of view. 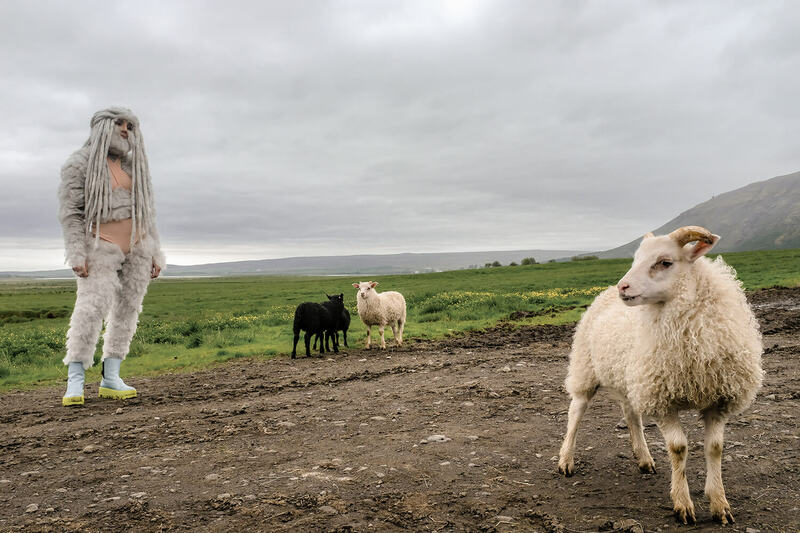 In his project Species without Spaces, Thomas Pausz is concerned with translating and reinventing interspecies relations in search of a new ethical imagery. “Designers are at the forefront of creating and manipulating images, forms and myths,” Thomas argues, aiming at ‘re-wilding’ our perceptions of the natural world as he puts it himself. In a series of artefacts and films, Thomas subverts existing iconographies of the non-human world that he considers represented for instance on postcards, in iconic landscape painting or in how nature-observatories are built. The core of these experiments with media is to question the accepted categories and hierarchy of species. 3 Will Steffen, Jacques Grinevald, Paul Crutzen & John McNeill, „The Anthropocene: Conceptual and Historical Perspectives,“ Philosophical Transactions of the Royal Society A: Mathematical, Physical and Engineering Sciences, #369 (2011): 842, DOI: 10.1098/rsta.2010.0327. Haraway argues against such a notion, with a simple enough objection – how can climate change be the responsibility of a whole species? Such an idea implicates billions who have never been empowered to disrupt anything on a global scale.